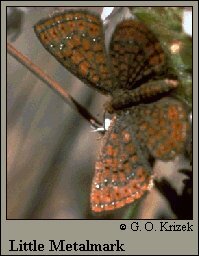 Identification: The only metalmark of the southeast Atlantic coastal plain. Small. Upperside rusty orange, with fringes dark and not checkered. Underside brighter orange. Wing Span: 1/2 - 1 inch (1.3 - 2.5 cm). Life History: Males perch on low-growing plants to wait for females. Eggs are laid singly on host plant leaves. Caterpillars rest underneath leaves during the day, emerging at night and on cloudy days to feed. Flight: Three to five broods from March-October. Caterpillar Hosts: Yellow thistle (Cirsium horridulum). Adult Food: Short-flowered composites including yarrow, lance-leaved coreopsis, fine-leaved sneezeweed, and blue mist flower. Habitat: Grassy areas of the coastal plain and in open pine woods, savannah, and salt-marsh meadows. Range: Atlantic coastal plain and piedmont from Maryland south to Florida and the Keys; west along the Gulf coast to southeast Texas. Conservation: Colonies are localized but apparently conservation concern is minimal.